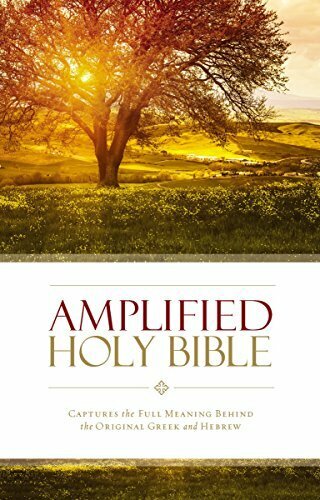 For this update to the Amplified Bible (AMP), the goal of the translation team was to enhance the appeal of the Amplified Bible by refreshing the English and refining the amplifications for relevance and clarity. The result is an Amplified Bible that is easier to read and better than ever to study and understand. The Amplified Bible of 2015 includes more amplification in the Old Testament and refined amplification in the New Testament. Additionally, the Bible text has been improved to read smoothly with or without amplifications, so that the text may be read either way. The same feel and style of amplification has been maintained, so that those who read the classic Amplified Bible will be able to easily transition to the new text. The AMP was the first Bible project of The Lockman Foundation. Its goal was to take both word meaning and context into account to accurately translate the original text from one language into another. The AMP does this through the use of explanatory alternate readings and amplifications to assist the reader in understanding what Scripture really says. Multiple English word equivalents to each key Hebrew and Greek word clarify and amplify meanings that may otherwise have been concealed by the traditional translation method. The first edition was published in 1965. The AMP is based on the American Standard Version of 1901, Rudolph Kittel’s Biblia Hebraica, the Greek text of Westcott and Hort, and the 23rd edition of the Nestle Greek New Testament as well as the best Hebrew and Greek lexicons available at the time. Cognate languages, the Dead Sea Scrolls, and other Greek works were also consulted. The Septuagint and other versions were compared for interpretation of textual differences. In completing the Amplified Bible, translators made a determined effort to keep, as far as possible, the familiar wording of the earlier versions, and especially the feeling of the ancient Book. This version of the Amplified Bible is the 2015 edition. For the 1987 edition of the Amplified Bible, see the Amplified Bible Classic Edition (AMPC).